Hey thanks a ton for stopping by . I love what can be done with reshade. Things got a little confusing though as the vertex comments were for dolphin's shaders and not reshade. Still, that will help me if I do vertex stuff in reshade. I 100% agree I need to cleanup my shader file next. I got stuck on making a little derpy program with sliders that dynamically scale options/user variables. I'll stop by the reshade forums after I learn some cleaner coding for it. I tried to hack out the needless parts and I got no image. Need to do it a bit more carefully lol. /edit To fix the yellow issues, open the noise.tga and resave as a noise,jpg. /edit2 and rename it in the.fx ... I'll post a new one that works without needing all that soon. (02-15-2015, 10:34 PM)One More Try Wrote: /edit To fix the yellow issues, open the noise.tga and resave as a noise,jpg. Worked like a charm! Had to change the ".tga" to ".jpg" in the file too. Looking forward to see what you do with Reshade . Much, much cleaner .fx shader file. New noise.png that works correctly. No more yellow. Includes my derpy program to change options with sliders, so you don't need to open the .fx (unless you want to change noise color). Maybe still room for a little improvement. Maybe I can practice some making multi-pass shaders on Reshade next. (02-15-2015, 02:05 PM)One More Try Wrote: I don't need noise with reshade, since it lets you load a noisy image and combine it with the game's image, which is easier. I could find something like a crumpled paper image and then use that. Why load a LUT when you can run a two line noise function, which isnt as expensive as Perlin noise, and mix that with the storybook color? Quote: About the "noise" intrinsic: HLSL had one back in shader model 1, but it was removed starting with shader model 2. Now I didn't know that at start and thus exposed it in ReShade as well, although it uses shader model 3-5. It is removed again in the current build, but still available in the public one as of today. This means you can use it, but you'll get a compiler error under all Direct3D versions. It will work under OpenGL though, because translated to the equivalent "noise1"/"noise2"/"noise3" GLSL intrinsics there, which are still available in GLSL4.3 (which is the version ReShade currently uses). To summarize: Don't. It's deprecated and removed in the next version, faster to use a lookup texture like suggested anyway. Noise now exists in GL4? Never knew that. I generally have my own small noise function that I use for my shaders. It can't just be random noise, it has to have a certain lumpy look to it or else it'll just make things worse. It's easier to adjust an image to get it right. It also seems like it might feel too static, with the game image moving on top of a static background. The original seems to work good in Spyro, so maybe this needs more tweaking. Updated the Dolphin Storybook shader. Made a pack that includes an Ink (no color except background color) storybook shader. Added StorybookII (finer control and different type of mixing). Added a tab to manually adjust background color. Fixed a bug that could cause aliasing and poorer graphics. Added a slider to fine-tune Sampling offset (may not need it). It's the storybook pack file in the original post. Any luck on the Ambient Occlusion? I REALLY need that effect working. I've seen some success by others, but nobody shares how they achieved it. 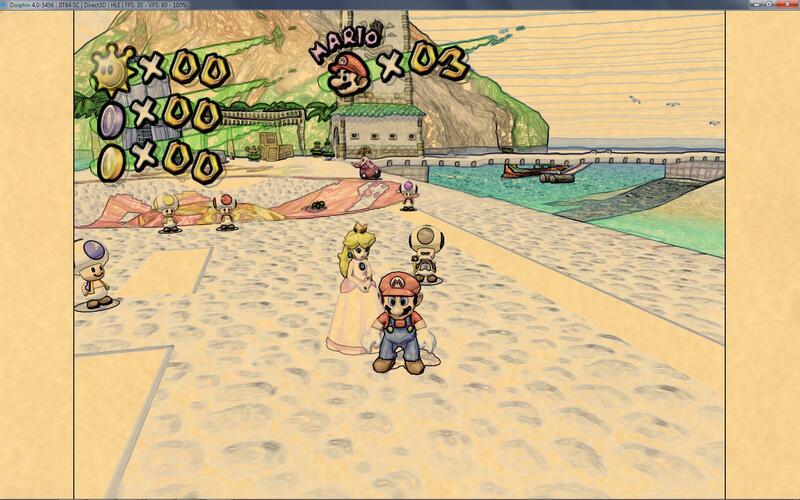 Someone asked me to port a newer version of xbr shader to Dolphin specs. I did it by mimicking other shaders already working on it by default. Though I can't test it in high resolutions as my note has only 1366x768 of native res. Anyway, It's intended only for 2D games and the internal resolution must be set at native 1x. Save it as xbr-lvl2.glsl and put it inside Dolphin shaders folder. (04-25-2015, 04:27 AM)Hyllian Wrote: Someone asked me to port a newer version of xbr shader to Dolphin specs. I did it by mimicking other shaders already working on it by default. Though I can't test it in high resolutions as my note has only 1366x768 of native res. Anyway, It's intended only for 2D games and the internal resolution must be set at native 1x. Could you post an attachment with the ready to use file?